Size of this preview: 427 × 600 pixels. Other resolutions: 171 × 240 pixels | 342 × 480 pixels | 547 × 768 pixels | 1,232 × 1,730 pixels. 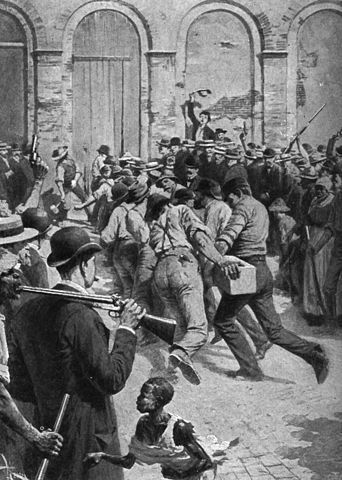 English: An episode of the lynching of the Italians in New Orleans in 1891 after the murder of police chief David Hennessy. The citizens breaking down the door of the parish prison with the beam brought there the night before for that purpose. Source Andrews, E. Benjamin. History of the United States, volume V. Charles Scribner's Sons, New York. 1912.